Blood flow to the brain needs to be constant and adequate so that a sufficient supply of oxygen and nutrients can reach it. The brain is an ‘oxygen hungry’ organ accounting for about 20% of the oxygen consumption in the body although it only weighs in at 1% to 2% of the total body weight. If there is an interruption of this vital supply even for a few seconds then brain function is disrupted and may lead to a host of signs and symptoms. However, when the blood is cut off for longer periods, like several minutes, the brain cells will die at the affected area and permanently lead to some level of neurological dysfunction. A stroke is the disruption of brain activity which arises with loss of circulation to the brain leading to damage and death of brain tissue. It is also known by the now outdated term, cerebrovascular accident (CVA), although terms such as cerebrovascular disease and cerebral infarction are preferred. It is important to note that with a stroke there is death of brain cells usually in a circumscribed area (focal infarct) which is not present in a mini-stroke. The term ‘stroke’ is broad and includes a number of cerebral insults that affects neurological activity. However, it is accepted that the term is commonly used to describe cerebral ischemia and infarct associated with vascular disturbances. A mini-stroke is an episode of temporary reduction in blood supply to the brain leading a short term disruption of brain activity. A mini-stroke is medically referred to as a transient ischemic attack (TIA) although other terms such as a pre-stroke or warning stroke may also be utilized. Although there is no death of brain tissue in a mini-stroke, it is hypothesized that some degree of tissue death does occur but is too small to cause a permanent disruption of brain activity. However, the term ‘mini-stroke’ can also be misleading because it may infer that there is some minor damage of brain tissue leading to permanent neurological dysfunction, albeit it minimal. This is not the case with a TIA as the symptoms resolve within minutes or at most within an hour and normal functioning is noted. A person experiencing a TIA does require medical attention but is not permanently disabled and unable to function. A TIA does, however, indicate an impending stroke and is therefore a warning signal and the terms ‘pre-stroke’ or ‘warning stroke’ may be a better choice. There are two types of strokes – ischemic stroke and hemorrhagic stroke. The causes and initial pathophysiology may vary slightly but the ultimate effects are the same – dysfunction of brain activity due to tissue death. The level of dysfunction in an ischemic stroke may occur suddenly, be worse immediately after the episode and gradually improve although not fully. With a hemorrhagic stroke, the effects are gradual and progressive. An ischemic stroke occurs as a result of an interruption of blood supply to the brain. 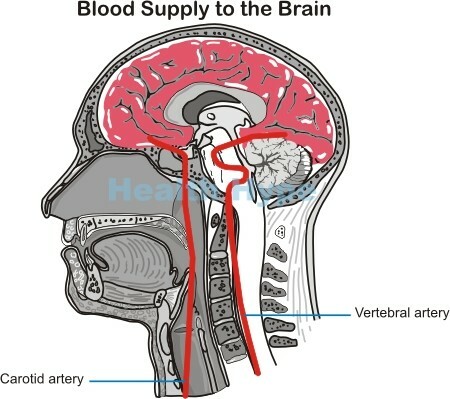 The brain derives its supply of arterial blood from the carotid arteries (front of the neck) and vertebral arteries (back of the neck) and the branches of these arteries. At the base of the brain, these arteries form a circular network known as the circle of Willis, which ensures that the brain is constantly fed with oxygen and nutrient-rich blood. Any significant narrowing of these arteries and/or total blockage by a clot will deprive the brain of blood. When blood supply is cut off, the brain tissue is deprived of oxygen (hypoxia) and this leads to tissue injury known as ischemia. The brain cells are depleted of its energy producing molecule, ATP (adenosine triphosphate). Certain amino acid neurotransmitters like glutamate are then released. This allows the influx of large amounts of calcium and sodium into the cell which draws in water. The cell becomes swollen and is therefore destroyed (cytotoxic edema). The single cell does not die in isolation but large numbers of cells in the affected area die simultaneously which is collectively termed as necrosis. A transitional area between the necrotic tissue and normal health brain tissue is known as the penumbra (ischemic penumbra). The cells in this area have undergone injury from oxygen deprivation (ischemia) and are swollen but have not died. It is at high-risk of death if medical intervention is not rapid. Cells in the penumbra, if severely damaged, may trigger its own death by a self-programmed mechanism known as apoptosis. Ischemia of the brain tissue (cerebral ischemia) is most often focal meaning that it only affects a part of the brain and not the entire organ. However, it can be global when blood supply to the entire brain is reduced simultaneously and there is no pathology specific to the arteries supplying the brain. This may be seen with low blood pressure (hypotension), shock or cardiac arrest (sudden cessation of heart activity). An ischemic stroke is more common, accounting for up to 85% of all strokes. It can be further classified as thrombotic or embolic. Irrespective of the initial cause of arterial narrowing, the eventual obstruction is almost always caused by a blood clot (explained further under blood clot in the brain). If this clot forms at the site of the narrowing, it is known as a thrombus, hence the term thrombotic stroke. However, the clot may form elsewhere in the body, usually in the heart, break away from this original site and lodge in narrowed artery supplying the brain. This ‘runaway’ clot is known as an embolus, hence the term embolic stroke. Rarely, an embolus may be composed of other substances like a fat globule, scar tissue and other semi-solid to solid material that should not be moving freely in the bloodstream. A hemorrhagic stroke is caused by bleeding (hemorrhage) into and/or around the brain (explained further under bleeding in brain). It arises when a blood vessel or several vessels in the intracranial cavity rupture. Blood pools within the cavity, particularly within spaces in the brain, and causes tissue injury by one or more mechanisms. Firstly, blood leaking from one part of the artery may not be able to reach tissue further down its route. Secondly, when tissue makes contact with whole blood there is irritation and inflammation of the area. Accumulation of blood in pockets (hematoma) compresses brain tissue and even blood vessels thereby reducing the blood flow through it. Then the accumulation of blood within the cranial cavity raises the intracranial pressure (ICP) which is explained further under pressure on the brain. Irrespective of the mechanism, there is death of brain tissue (infarct) as is seen with an ischemic stroke. Overall, a hemorrhagic stroke occurs in less than 20% of stroke patients. Being the less common type of stroke often means that it is given less attention, but its equally as important and serious as an ischemic stroke.